A bionics researcher with the University of New Brunswick is part of a team that has discovered a pioneering technique to restore natural movement sensation in patients with prosthetic arms. Jon Sensinger, associate director of UNB’s Institute of Biomedical Engineering, along with fellow researchers in Canada and the U.S., have today published their first-of-a-kind findings in Science Translational Medicine. The team, led by the Cleveland Clinic in Ohio, used small but powerful robots to vibrate specific muscles to “turn on” patients’ sensation of movement, allowing them to feel that their fingers and hands were moving and that they were an integrated part of their own body. By feeling their missing hands while controlling their bionic prostheses, patients in the study could make complex grip patterns to perform specific tasks as well or better than able-bodied people. "This approach opens a pathway to seamless integration of minds and machines," says Dr. Sensinger. "This breakthrough establishes a way of restoring in amputees an innate sense of where their artificial limb is, helping them feel intrinsically in control of their prostheses." This is important because when an able-bodied person moves, the brain constantly receives feedback regarding the movement’s progress. This unconscious sense – known as kinesthesia – prevents errors in movement, like overreaching, and allows the body to make necessary adjustments. People with amputation lose this essential feedback, however, and as a result, cannot control their prostheses without having to watch them carefully at all times. Other co-authors on the study include Jacqueline Hebert from the University of Alberta, Ravi Nataraj from the Stevens Institute of Technology in Hoboken, N.J. and Brett Mensh from the Howard Hughes Medical Institute in Chevy Chase, MD. 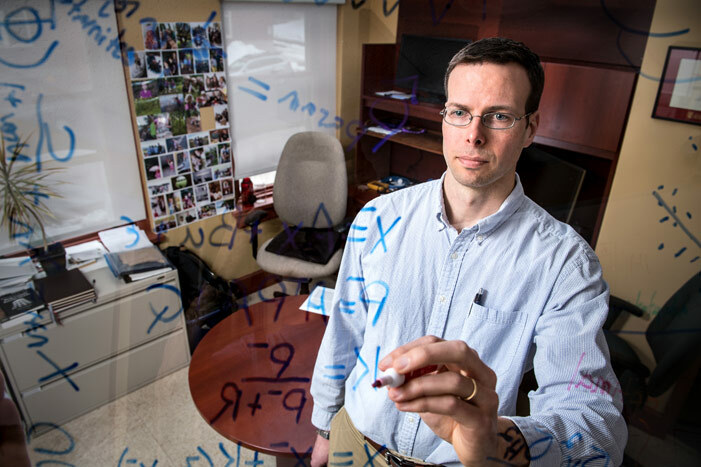 Photo: Jon Sensinger, associate director of Institute of Biomedical Engineering at the University of New Brunswick. Sensinger is part of a team of researchers from Canada and the U.S. who have developed a pioneering technique to restore natural movement sensation in patients with prosthetic arms. Credit: Rob Blanchard / Photo UNB.